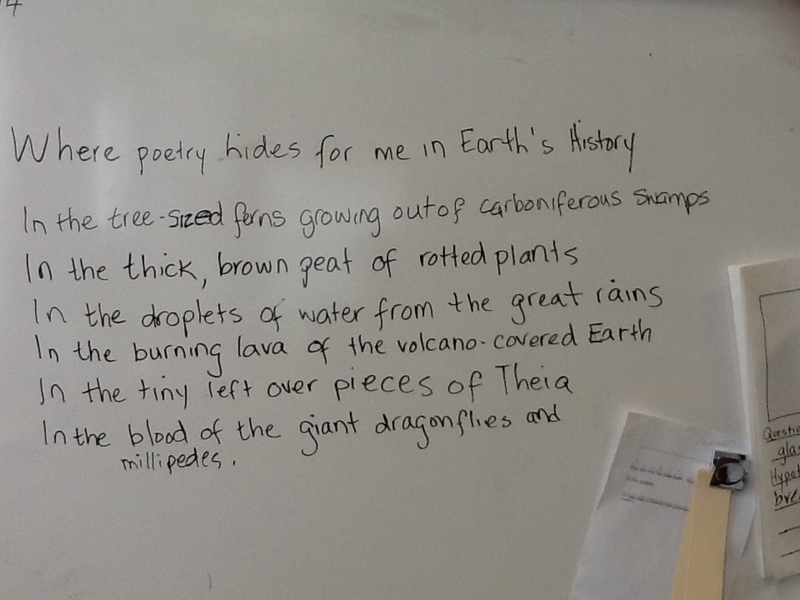 In perfect time for National Poetry Month, Anna’s post is full of inspiration for helping your students find their inner poets. 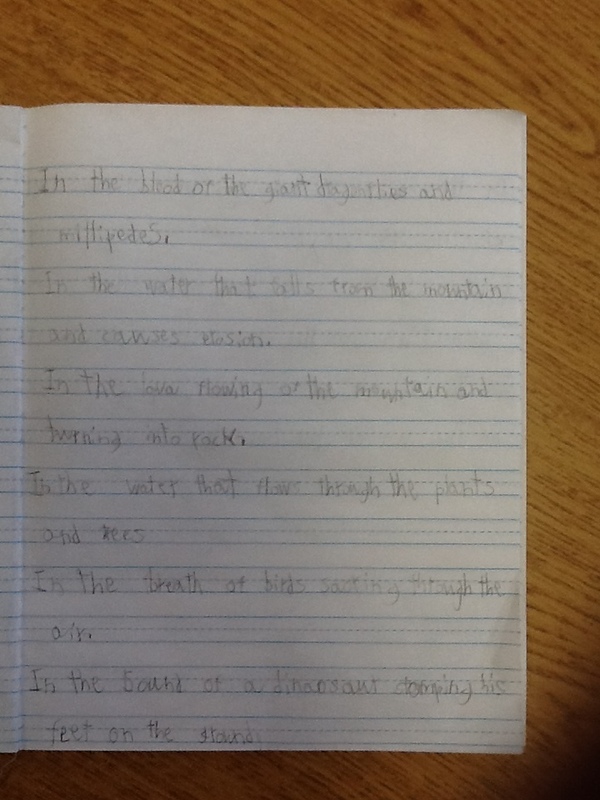 Anna gives us a peek into a classroom where students used a mentor text and some inspiration from science class to get excited about poetry. When I launch a poetry unit, I often begin by reading Naomi Shihab Nye’s stunning poem Valentine for Earnest Mann. This is one of those poems that floors me with its simple complexity, moving me to tears each time I read it. It manages to be both funny and sad, tongue-in-cheek, but very serious. It expresses something that, upon reading, I know instantly to be true but would never have expressed in such a way. When I read it at the start of a poetry unit, I read it once through without stopping, and I let the words land on the children, making whatever impression they will make. I let the children talk and wonder. Then, I read the poem again so that we can unpack it a bit together. Many children express surprise that what I have just read to them is, in fact, a poem. They say they thought poems had to rhyme. They say they thought poems had to be about love. Or about something serious. Or about someone’s mom or grandma. They say they didn’t think poems were usually about skunks, or that poems could hide in the eyes of skunks. poems hide. In the bottoms of our shoes, they are sleeping. They are the shadows drifting across our ceilings the moment before we wake up. What we have to do is live in a way that lets us find them. In the blood of the giant dragonflies and millipedes. In the water that falls from the mountain stream and causes erosion. In the lava flowing on the mountain and turning into rock. In the water that flows through plants and trees. In the breath of birds soaring through the air. In the sound of a dinosaur dropping his feet on the ground. In the hurrying footsteps of a dinosaur chasing his prey. In the gigantic bang that made the formation of the sun and our planet. In the splash of a fish jumping out of the water for breath. in the droplets of water from the great rains. in the fiery hot meteors in the Hadean eon. in the fat, brown peat. in the warm swampy waters of the Carboniferous period. Kids demonstrated retention of a great deal content knowledge. 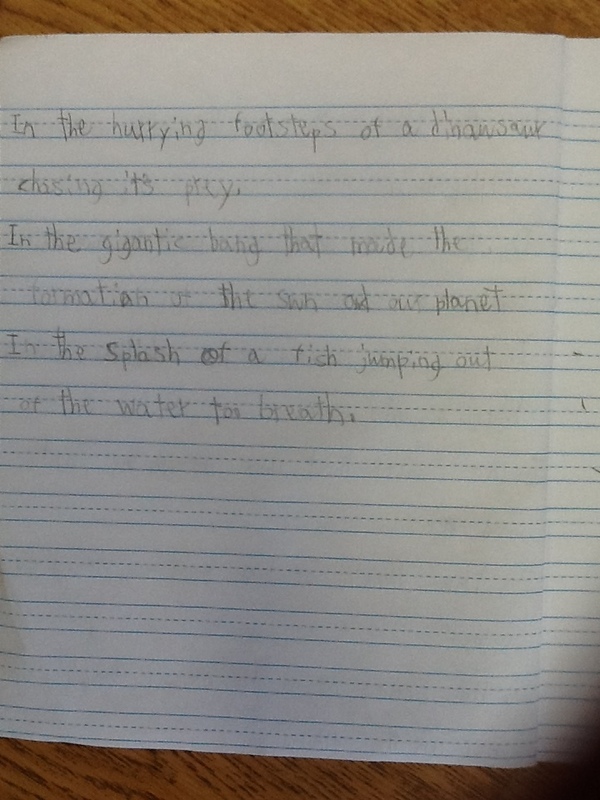 Many kids wrote with a great amount of volume and stamina, two writing skills that can sometimes be missing from poetry workshops (and from content-based writing workshops, for that matter). This work provided an accessible entry point and strong scaffold for students who often struggle with writing. What a refreshing way to write about a content-based study! Poetry has a place in all content areas! 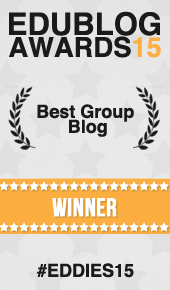 Thanks for sharing this great post. INDEED!!! I love all the components of this objective. I also love Sylvia’s comment about creating poems in Texas history. I use to do this, many moons ago, so I think it is time for me to go back to this activity once again. It’s nice to know that what you’re doing in your class is also being done in other classes. We are creating poetry in Texas history. We’ve done Haikus, Cinquains, and Subject poetry. It is a great way to see what the students have retained in the content area. I used this wonderful poem in writing exercises with my 9th graders last year, but I love this way of making it cross-curricular–fantastic!